Apple Adds Killer Feature To iPhone. In late-breaking news just weeks before its launch, Crazy Apple Rumors site has learned that Apple has added a killer feature to the iPhone that is sure to secure its success. Sources in Apple’s iPhone development group have revealed that in addition to acting as a phone, an email client, a web browser, a mapping platform and a portable entertainment system, the iPhone will also dispense beer. The company has added a small tap to the side of the iPhone that will, when pressed, release the frosty, refreshing beverage that has been enjoyed since the time of the Pharaohs. “This could be the holy grail of mobile connectivity,” said Shawn King, host of Your Mac Life. “To be able to access my beer on-the-go… I can’t even think of a reason why I’d go home again. The details of this startling new feature were not available at press time. It’s not known, for example, exactly how much beer an iPhone can hold and whether or not Apple will rely on third-party peripheral developers to build add-on kegs. But most were not concerned by the lack of details. “It’s a phone that dispenses beer!” exclaimed Apple follower Derik DeLong. Some of the slower pundits were concerned about Apple “tapping” the iPhone. “I’m concerned about Apple tapping the iPhone,” said Rob Enderle of the Enderle Group. Apple declined to comment officially for this story, but it did have beer on its breath. Might I recommend a third party peripheral of Guinness or a nice Samuel Adams? Hmmm, Moltz … a minor misspelling …we’ll forgive you … too much beer and all. Damn! When I read the title of the post, I thought that Jobs and the development team finally grew some hair on their collective butts and made a product that could inflict lethal damage. I mean, wouldn’t that make Apple detractors much less likely to spout off about the versatility of their pet product if they knew that if you piss off an iPhone owner you might get a first-hand demo of the “killer feature”? You’re damn right it would! Oh yeah, while we’re doing the spell check thing, it’s pundits. Ninth! And I’m buying a round for all! Or maybe Enderle is trying to get all Ivy League on us. In which case, I shouldna said anything. Kool-Aid would be a better beverage to dispense. The iPhone is proof that Steve loves us and wants us to be happy. Swallowed his gum eh? Perhaps Ole Uncle Enderle can’t chew and pat his head at the same time. I need to ask a question that I’ve been wanting to ask for ages….who are the rest of the people in the Enderie Group?? I have to ask…is there an Apple geek who’s ever got to the bottom of a full glass of beer without falling over and puking on his sandals? Dang! I thought the killer feature would be … that the iPhone could kill people. I mean, what do you think I expect from this site?!! How could you miss your obvious chance to bring up sexbots and ninjas?!!((&#$!^(!&)! Fan boy, I shall answer you… I am one of the hugest mac geeks in the world. This very night, I gave a PC IT guy his first mac since the days of os 7. It was an old dual 500mhz g4. once that was called a supercomputer, now it is almost scoff-able… but this aged mac did shine with all if its glory, creating a convert instantly. So that is the kind of computer nerd I am… I donate old macs to PC folk to show them the light. I live and dream mac, and I am counting the days til my beloved iPhone is released. I also own a kegerator. I usually buy a local brew called “Kilt Lifter” (6% alcohol) and a keg lasts me one week. I drink out of 1 liter german beer glasses. I can’t guarantee I won’t puke if I drink a gallon of beer, but YES – I can drink my way to the bottom of a glass or two and keep my footware vomit free. Therefore, for me, this is the greatest feature in the world. The one I have been waiting for its as if Steve Jobs read my mind… or better, shown me the possibilities that I never dreamed could exist. For example, earlier today I was at work and thought, “I need a beer.” First I think to my self “I wish I had my kegerator here.” then I think, “I wish I had an iPhone to look up a nearby bar.” With this new feature – I HAVE MY KEGERATOR WITH ME!!! wow.. I am beginning to tear up just thinking about it. if you over use the iPhone’s tap, it could very well be a killer feature… especially when combined with automobiles. also, over-use can have you thinking your toaster (or maybe your harmon kardon iSub) is a sexbot. additionally, severe overuse can case delusions of being chased by lesbian ninja, possibly leading to dangerous limb breaking accidents. so it does all relate to killer ninja sexbots if you think about it. Oh boy, tell me there’ll be a wireless pudding adapter for the tap. Please please please. Will I be able to get whatever beer I like from the iPhone. It is information like that that I need, so off you go and get it Young Johnny. The Linux phones dispense WINE. Now, a 32-inch screen would be a killer feature for an iPhone. UhhhDude, please keep your frothy fermentations overflowing the margins: a 32-inch screen would hold a lot more beer. Dang it. I just checked the iPhone dept. here at Cupertino and rummaged through the blueprints. Looks as though the designers were worried about airplane use–it only holds 3 ounces of beer. *hiccup* They put Sam Adams in it too. Classy. That’s it I’m sueing apple for stealing our idea. Way back in the days of the Mega-Post we found a way to take a Hallmark iPod, the hmPod, and wire it so the line out fed into the line in. The hmPod was forced to constantly listen to all that Hallmarky sentimental crap it spewed and that caused the hmPod to create unlimited amounts of booze that it would attempt to drown it’s sorrows in. A user could extract the alcohol for consumption. Apple obviously stole our prototypes. Now we finally know why the Mega-Post was closed down. Apple sealed it off so we could never retrieve our inventions as proof that we did it first. I sure have to re-examine my position relative to this iPhone thing now. I still hate phones, but I love beer more! Further research indicates that this will use some sort of quantum-entanglement teleportation device to insure a fresh supply of the user’s preferred beer is always at immediate beck and call. Make mine Guinness! @ blank: Sorry I missed that when rummaging through blueprints. I overheard Woz chatting to himself in the mens room; turns out Apple realized a loophole in US law–the beer teleportation device alone weighs 3 ounces and does indeed connect to a beer repository in Boston, MA, using a proprietary protocol and extendable hose. The tap and teleportation device will be detachable. Sorry Moltz, you got it wrong. 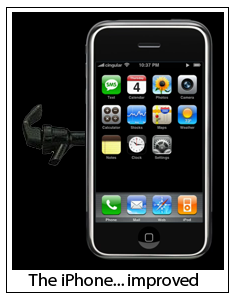 The iPhoneTap is a secret device that will be sold exclusively to the NSA, not a tap on the side of the iPhone. This would be too good to be true, if not for this little fact: the iPhone will embed your phone number in your beer. I’m concerned about keg life and lack of keg replaceability though. Why do I feel this is a Conspiracy with Apple and Google. Only locals drink Kilt Lifter. If you get it on tap, right there on Pike Street, you are in Nirvana. (I know, Nirvana is from Aberdeen, but you get the idea anyway). While a killer feature is definitely cool, I think it would be more useful in day-to-day life to be able to set it just to stun. Are you listening Apple? so would this be an enabler of drunk dialing? iphony, it includes a breathalizer to enforce drunk dialing. If you don’t say it drunk, it’s not worth saying. WHO THE HECK IS CAPTAIN STABBIN? The good news is that they don’t need FCC approval for this modification to the design, because the Justice Department has already authorized nearly unlimited phone taps. Sorry but I thought the decive of having the leads named Henry and Annie were confusing and may have given the wrong impression to people who are not familiar with John Denver. Henry acted pretty foolishly looking in his pants and hopping into the cold river what was that about? Annie’s Song was trivialized by having her sing the line Come fill me again . Calypso was totalling misused as far as I’m concerned. Did the writer know what Calypso was and who it belonged to? Sorry but John Denver stood for humanitarianism, conservation, peace and an end to world hunger. Topics which are more relevant today than 30 years ago when the songs were written. I think most John Denver fans would have preferred a story that promoted his most passionate causes and not one in which he appears to be a Jethro . Being a country boy does not make one an idiot.I did appreciate hearing some of the less heard songs, but there were not enough of them and again, not used to the full extent of their meaning.I really hope this play does not go futher than Five Towns College. I expected much more from this Tony winner. Previous Previous post: iPhone Ads Reveal Restrictions. Next Next post: Apple Community Ponders Identity Of Fake Blogger.